Most New Yorkers look at Fresh Kills and see a dump. But designers have visions of a "nature lifestyle island" with habitats for native fish and birds; they imagine biospheres and waterparks � filled with reused garbage barges -- and a picnic table three miles long made from recycled laundry detergent bottles. These were some of the designs submitted in a contest to transform the Fresh Kills landfill, which took most of the city's garbage until it was closed last March, into something ecologically sound, even beautiful. They were not trying to be fanciful. "This competition was not designed to provoke thought," asserted Kent Barwick, president of the Municipal Art Society. "This was meant to build." But with the city's looming $4 billion deficit and concern about the alternatives to the Staten Island landfill, Fresh Kills could remain what it was for half a century: four mountains of garbage on a site more than two and one half times the size of Central Park. To make up for the loss of Fresh Kills, the city plans to ship much of its garbage out of town by way of a mega-transfer site in Linden, New Jersey. But final approval of that facility has been held up by court battles, criminal investigations, administrative haggling and charges of corruption. Even if the plant in New Jersey is built, the cost of disposing of New York's garbage will rise, a weighty consideration in this day of multi-billion dollar budget gaps. Residents of many Brooklyn and Queens neighborhood complain that the city's new waste disposal program has put a blight on their neighborhoods. And critics of the city's plan says it does nothing about commercial garbage, which is handled by private companies. When garbage piled up on Staten Island, at least some city residents, and many politicians, could not ignore it. So garbage now is shipped beyond the city limits, hundreds and perhaps even thousands of miles away, out of sight and forgotten. But, environmentalists say, garbage will not just go away � and, instead of trying to export its garbage problem, New York can and should take steps to take care of it where it is generated. 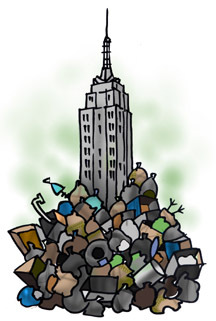 Each day, New York City produces as much as 36,200 tons of solid waste. The Department of Sanitation is responsible for the approximately 13,000 tons generated by residents, public agencies and non-profit corporations. This is the trash that had been hauled out to Fresh Kills for a half-century. The remainder of the city's garbage, generated by businesses and restaurants and commonly referred to as the commercial waste stream, is handled by private carters. The waste transfer stations that previously managed the city's commercial waste now handle residential garbage as well. This has created an array of problems in the low-income and minority neighborhoods in Brooklyn, Queens and the Bronx where they are located. "They smell, they got rats, they don't really hire that many people, and the people they do hire they probably pay less than legal wages," says Timothy Logan. Logan is the coordinator of the Organization of Waterfront Neighborhoods (OWN), a citywide coalition attempting to find environmentally sound ideas for handling garbage in New York. "The interim plan, to the extent that it simply relies on existing private facilities, reflects no attempt by the city to minimize adverse local impacts," adds Benjamin Miller, author of "Fat of the Land," a history of New York City's garbage, and a former director of policy planning at the sanitation department. "Consequently, the interim situation, I think, can safely be considered the worst-case extreme compared to which almost any planned system would be an improvement." The Giuliani administration and its sanitation department assured the public that the city's current practice was a temporary solution. Of course, when Robert Moses opened Fresh Kills in 1947, he promised it would remain in use for only three years. Last February, the Giuliani administration contracted with Browning-Ferris Industries, a subsidiary of Allied Waste Industries, the nation's second largest waste company, to build a 50-acre waste transfer facility in Linden. According to the city's Solid Waste Management Plan, half of New York's residential garbage will be shipped by barge to Linden where it will be sealed in containers and sent by train to various locations south and west, including Pennsylvania, Virginia, and Georgia. Officials in Linden, across the Arthur Kill waterway from Fresh Kills, have approved the plan for the garbage facility. Proponents claim the transfer station, now slated to open in 2004, would supply the struggling city with jobs, much needed since major oil refineries left the area in the 1960s and 1970s. "There's no down side," said Mayor John T. Gregoris. "The barges will pull in and the trains will pull out. You won't hear it, see it, smell it, and we make $4 million or $5 million." But it's not quite that simple. Some say that the project is rife with corruption. For instance, the owner of the land to be leased to Browning-Ferris is Dominick Pucillo, who is married to the Linden mayor's daughter, Jodi Gregorio. It has been said that for every $1 million the city of Linden will make from the deal, Pucillo will make $7 million. Pucillo, who could not be reached for comment, owns Tremley Point Marine Terminal LLC, a waste disposal company that has been fined in excess of $1 million for various environmental violations. Community residents worry about increased neighborhood truck traffic and pollution from the facility. Although the proposed site is nearly two miles from any residential dwelling, there is a concern that it will hurt property values. "I guarantee it is not a done deal, said Beatrice Bernzott, president of Jerseyans United to Stop New York City Trash. "Somewhere along the line, in this long, involved process, we are going to find an office or a judge who is going to say no to this." Some officials already have. In January, the Borough of Metuchen, New Jersey, filed suit to overturn Union County's approval of the facility, asserting that the trains moving trash from the transfer station would endanger residents near the natural gas pipelines that flank the tracks. Former New Jersey Attorney General John Farmer placed the deal under investigation last March. New York City has no alternative to the Linden facility. If the facility is blocked, for whatever reason, the city will have little choice but to send it s trash elsewhere, at great cost to the city's finances and environment. Replacing Fresh Kills comes at a high price. While it cost the city $43 to ship a ton of garbage to the Staten Island site, it is estimated to cost anywhere from $60 to $100 to ship the same ton out of state, depending partly upon whether Linden ever opens. In the last three years, the city's sanitation budget has ballooned from $500 million to $838 million. The closing of Fresh Kills is expected to increase the price tag to an estimated $1.1 billion by 2005. That is a lot of money, particularly with the city in a financial crisis. According to industry reports, exporting garbage is only going to get more expensive. In the last decade, private trash haulers along the eastern seaboard have increased tipping, or dumping, costs by more than seven percent each year. Landfill prices have increased at an astronomical rate of 50 percent in the last 18 months alone. And the city has little power to negotiate. A few large companies haul a majority of the commercial waste in the five boroughs. Most recently, Waste Management, the largest garbage company in the city, and the world, said that they needed the city's Trade Waste Commission, which regulates commercial carters, to raise the current price cap on carting costs or they would stop services and leave the city altogether. Over the last six months, they have dropped thousands of customers from their routes, leaving garbage to pile up and rot on the streets. Relying on the Linden facility places half of the city's trash in the hands of a single private company, exacerbating the cost concerns. Furthermore, legislative changes such as a proposed moratorium on interstate waste hauling, or unforeseen developments like the World Trade Center disaster, have the potential to radically increase the overall costs. "We could effectively be held hostage by the waste management industry," said Benjamin Miller. "That's a particularly predatory segment of the private sector." Although the city's revised long-term plan does much to minimize environmental impacts, it does not address the environmental and public health problems that arise from the commercial waste stream. Currently, all commercial waste passes through private transfer stations. From them, it is trucked or taken by train to landfills around the country, mostly in Pennsylvania, Virginia and Georgia. The Department of Sanitation did not respond to repeated inquiries about its plan. The transfer stations have been linked to air and noise pollution in low-income and minority neighborhoods. Critics want the city to build transfer stations in a more diverse range of neighborhoods. They also want the city to expand the handling capacity of existing barge stations to help alleviate the congestion caused by trucks carting commercial waste and reduce the city's dependence on the proposed plant in Linden. A joint study released in December by Columbia University's Earth Institute and Center for Urban Research and Policy identifies the long-distance export of the city's waste as a critical threat to the environment. The additional boat, rail and truck traffic required to bring the waste farther away will increase emissions of carbon dioxide, sulfur dioxide, chlorofluorocarbons (CFCs) and other pollutants that contribute to public health problems, acid rain, ozone depletion and global warming. The Columbia report concludes that, by promoting the export of waste, the plan encourages an "out-of-sight out-of-mind attitude" toward garbage. As a result, New Yorkers may find themselves recycling less, reusing less, and reducing less. Environmentalists want the city to strengthen its recycling and waste reduction programs. Despite an old law that required the city to recycle 25 percent of its recyclable material by 1994, the city hovers at around the 18 to 20 percent mark. According to WasteNews, an industry publication, the city recycles at about half the rate Philadelphia does, and fares even worse in comparison with Los Angeles and Chicago. Moreover, that figure includes the one-third of plastic, glass and aluminum and five percent of paper that is collected for recycling but contaminated and so not recyclable. "Our current belief is that the city does not follow state laws on recycling," says Timothy Logan, who is also chairman of the New York City Waste Prevention Coalition. "There is no enforcement on the commercial side." Any trip into any office building in Manhattan confirms the pathetic rate at which New York recycles paper. It is estimated that 27 to 40 percent of the city's trash is recyclable. Organic material suitable for composting comprises perhaps as much as half of this. A few years ago, the city put aside $20 million to build composting facilities. However, former Mayor Giuliani decided to postpone the plan until 2010. As a result, garbage that could be composted and reused for agricultural and energy-production is instead thrown into out-of-state landfills. The Organization for Waterfront Neighborhoods and Consumers Union have education and outreach programs designed to reduce the amount of waste created in the first place. There is also some momentum for a test of pay-per-bag programs, in which residents and businesses pay for each bag of garbage collected from their bins. Some are concerned, however, that such a plan might impose an unfair financial burden on poor people and families with children in diapers. Sixty percent of the city's trash will not be recyclable, and the city has to deal with it somehow. Landfills, even well managed and tightly controlled ones, pose a significant threat of future contamination. Though the liquids and leachates that seep from a landfill may be treated and handled for a while, reactions within the landfill continue for decades, even centuries after it closes, making landfills unlikely candidates for redevelopment. This, along with an array of other environmental and other public health concerns, was why so many Staten Island residents wanted Fresh Kills closed in the first place. But export does not solve the landfill problem; it just places the landfills somewhere else. Making New York more self-reliant in terms of garbage would encourage the city to confront the issue. Improving self-reliance could require regulating or even reclaiming the hauling industry from the big carriers, as well as constructing more city-o wned transfer stations and retrofitting existing city-owned marine stations. It might also entail constructing waste-to-energy incinerators in the city. The Columbia report states that these incinerators have become relatively clean and limit the emissions of mercury, dioxins and other toxins that are associated with the infamous stacks of the past. Producing waste from garbage could also help reduce dependence on highly polluting coal and on foreign oil. There is also a case for reopening Fresh Kills, which is said to have space enough left for at least 20 years of municipal garbage. Advocates like Benjamin Miller claim that this is the most sensible long-term solution for saving the city money and beating the garbage monopolies. However, re-opening Fresh Kills, even with reduced dumping, is a long shot, especially since Michael McMahon, a City Council member from Staten Island and adamant opponent of reopening Fresh Kills, is the new chairman of the Committee on Sanitation and Solid Waste Management. There has been little definitive talk from Mayor Michael Bloomberg on the existing export plan. But certainly his predecessor tried to close the door on reopening Fresh Kills. Shortly before he left office, Mayor Rudolph Giuliani said, "Fresh Kills is history. It's dead, dead, gone." But the city's past and future garbage lives on.